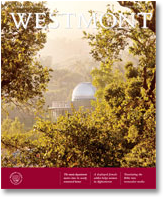 Convinced that competition in writing and debating encourages students to actively develop essential communication skills, Bob and Jean Svoboda proposed and funded the first annual intramural debate tournament and essay contest at Westmont this year (see related story on page 8). Pleased with the significant participation in the new endeavors (128 debaters and 54 writers), they have high expectations for the future. “Debate is the best teaching tool I know for learning how to think critically and analytically,” says Professor Mike Guiliano, who coordinated the competition. “The tangible rewards—$5,900 in prizes—made the contests even more exciting. But it was the merits of the debate experience itself that so many students buzzed about after the tournament. Titled “Passion and Civility,” the debate contest required students to exercise their minds by arguing pro and con on subjects ranging from the ethics of genetic engineering to outlawing racist speech. The two finalists, senior Jedd Medefind and first-year student Marina Ray, debated the issue of truth-telling in the courtroom, and the judges named Jedd the champion. Top winners in the other classes included junior Steve Patzia and sophomore Samantha Hill. 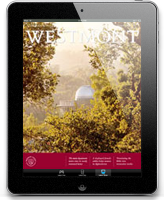 For “In Defense of Wisdom,” a persuasive essay contest recognizing that “ideas have consequences,” students discussed whether artists should be held responsible for reactions to their art. Judges awarded prizes on the basis of the quality of the writing and argumentation. A first, second, third, and fourth place prize went to a member of each class. First place winners included: Jedd Medefind (senior), Greg Rochfort (junior), John Thieszen (sophomore), and Karen Crabb (freshman).